I have an external graphics processor (eGPU) device, such as Apple External Graphics Development Kit, and I would like to use it in Parallels virtual machine (VM). First, make sure you have connected eGPU device correctly: plug eGPU device to Mac via Thunderbolt and connect your display directly to eGPU. For details, see Apple KB HT208544. 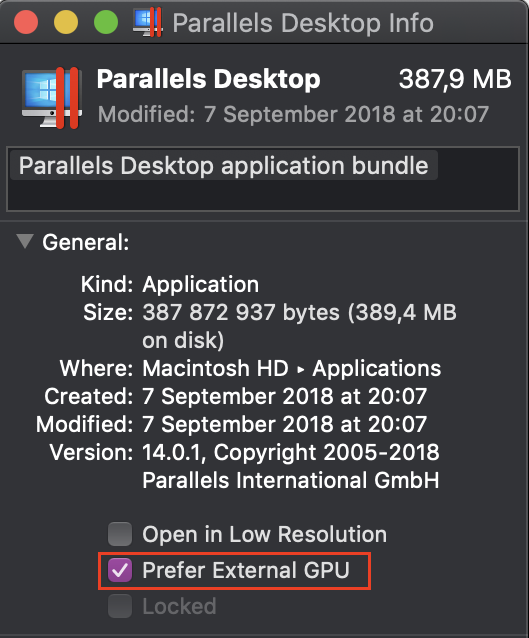 Once your eGPU device works fine in macOS, Parallels Desktop will use the available graphics resources to increase virtual machine video performance. Follow the instructions below to get it work. Note: eGPU device works when Mac connected to power adapter. 1. Open Finder > Applications > right-click on Parallels Desktop.app > Get Info. 3. If your virtual machine is already running, suspend it via Actions menu > Suspend but make sure to quit applications that use graphics. 4. Restart Parallels Desktop: right-click on the Dock icon > Quit. Launch Parallels Desktop then. 4. Move the VM window to desired diplay. Resume it via Actions menu > Resume. 5. Now the virtual machine will use eGPU device. With macOS High Sierra, Parallels Desktop uses the graphics of a primary Mac display. 1. Make the display that is connected to eGPU device your primary display: go to macOS System Preferences > Displays > Arrangement. 2. The white bar at the top of the blue box identifies your primary display. To make a different display your primary display, drag the white bar to the box that represents that display. 3. macOS will re-arrange opened applications' windows. If your virtual machine is already running, suspend it via Actions menu > Suspend but make sure to quit applications that use graphics. 4. Move the VM window to the primary display. Resume it via Actions menu > Resume. It is not possible to connect an eGPU device directly to VM, as they are being connected to Mac via PCIe interface which requires VT-d technology support to make virtualization of such connection possible, but VT-d on Mac can't be used for passing an external GPU to a virtual machine. If the primary monitor is connected to eGPU but your VM is located on another monitor, then VM performance can be degraded (comparing to situation when no eGPU is connected to Mac).